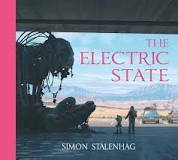 A poignant graphic novel set in an alt 1997 about a young runaway woman and her small yellow robot traveling through a ruined American landscape. It is filled with the ruins of giant battle drones and the often weird discarded creatures from a high-tech consumer society addicted to virtual reality, to the extent the population seems to have lost to the will to feed themselves. Each page is more disturbing than the previous one and there is extreme tension as she has to avoid the highways and constantly search for gas to keep going. VR has literally destroyed the world and is built by the same people who built the battle drones. Corporate America gone mad. The text is sad with a touch of self-preservation paranoia as they drift in a ‘borrowed’ car towards the West Coast. It’s like a ghost story from the future and the images are hauntingly beautiful. It’s curious to set this story in 1997 as it could all to easily be 2027 as we hurtle towards the technology to make all this possible. Simon Stalenhag previously illustrated an alternate Scandinavia in Tales from the Loop and Things from the Flood. As they say - it's eerie, nostalgic and deeply unsettling – this is a perfect dystopian volume that everyone should have on their coffee tables.